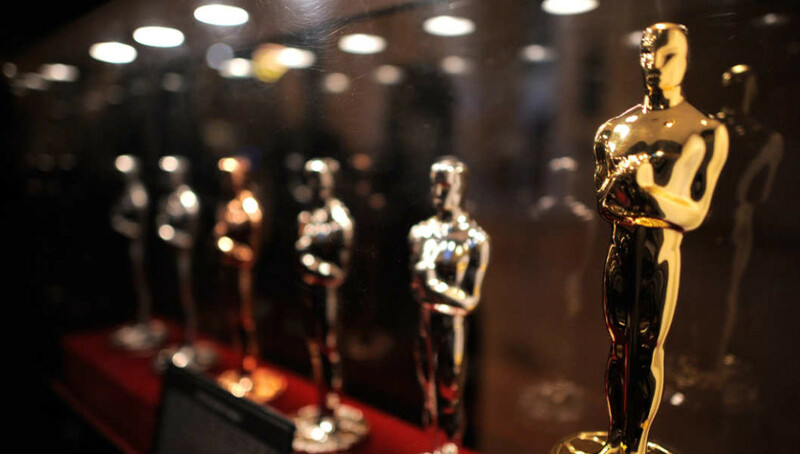 As the 87th Academy Awards ceremony approaches, bringing with it both celebrations for nominations granted and contempt for achievements overlooked, the debate over which films are chosen and what motivations are behind those decisions inevitably arises. The deliberations are fueled by the usual race/gender/class/religion/nationality divisions—all contentions we can readily observe, but most certainly find it difficult to verify with incontrovertible evidence. We can, however, understand whether other factors go into which films go up for nomination. In particular, does the month the film is released to theaters have any correlation with nominations? People have accused Oscar voters—the overwhelming majority are white, male, and over 60—of being racist and sexist, but do their voting patterns also exhibit preferences in voting for movies that come out towards the end of the year, while eschewing movies that play earlier? In other words, do Oscar voters appear to have short-term memories with respect to their voting decisions? And does this partly explain why some movies get nominated for Academy Awards while others are left out in the dust? This FilmClique report examines the 105 movies nominated for Best Picture and released to theaters during the 16-year period between 1999 and 2014. The results suggest that there is a link between the time of year a movie is released and its chances of being nominated for, and even winning, an Oscar. Voters most frequently nominate films that are released in later months. Overall, December and November releases have the most Oscar nominees and winners. The overall trend was that Best Picture nominees’ theatrical debuts tended to be concentrated in the latter months of the year: September, October, November, or December. 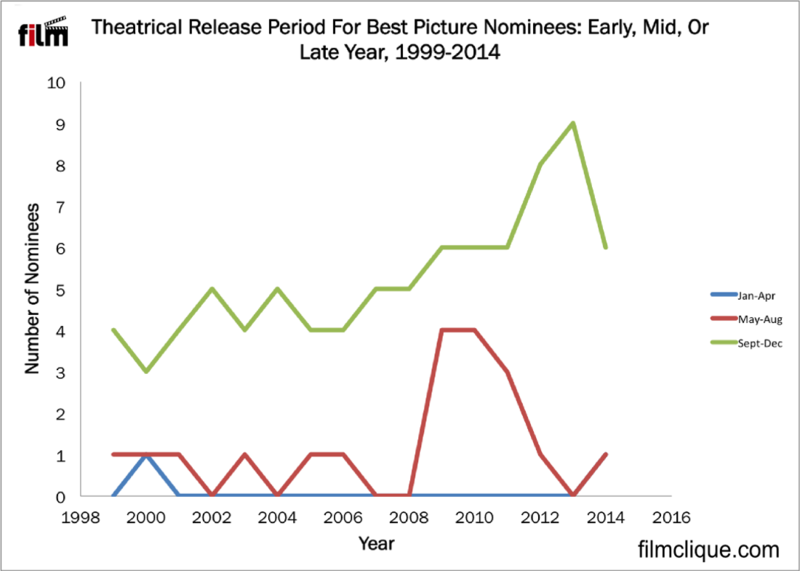 Figure 1 outlines the trend of more nominees having theatrical releases towards the end of the year. Eighty percent of all Best Picture Nominees were released during this late period of a given year. Fewer Best Picture nominees, 18 percent, were chosen from films that bowed out during the middle of the year: May, June, July, or August. Only 2 percent of films that were selected as Best Picture nominees premiered in theaters during the early period of a year: January, February, March, or April. Figure 1. The overwhelming majority of Best Picture films debut in the later months of a given year. For example, in 2012, only Beasts of the Southern Wild, with a June release, debuted prior to October. Best Picture Winner Argo first played in October; Life of Pi, Lincoln, and Silver Linings Playbook in November; and Amour, Django Unchained, Les Miserables, and Zero Dark Thirty in December. During the year 2013, all films nominated for Best Picture were released during October, November, or December. 12 Years A Slave, Gravity, and Captain Phillips were released in October. Dallas Buyers Club, Nebraska, and Philomena came out in November. American Hustle, The Wolf of Wall Street, and Her debuted in theaters in December. Movies released outside of the September to December window tended to have more of a chance of Best Picture nomination during the years when there were more movies nominated for Best Picture. Instead of the usual 5 nominees, the years 2009 and 2010, doubled the slate to 10 nominees each, the largest number of Best Picture Nominees to date. These were also the years where 40 percent of the films nominated did not fall in the September through December zone. Still, for both of these years, no films released between January and April received Best picture nominations. For following year, 2011, 3 out of 9 Best Picture nominees were released to theaters between May and August, though 2 of these films—Tree of Life and Midnight in Paris—were directed by veteran filmmakers Terrence Malik and Woody Allen, respectively. Arguably, either of these directors could have a film released during the coldest day in February and still make the Oscar ballot (though it is doubtful they would attempt such self-sabotage). Nonetheless, the years 2009, 2010, and 2011 all appear to be anomalies in the overall trend that saw 11 out of 16 years, including 2012 and 2013, in which films released between September and December made up 80-100 percent of the ballot. Figure 2 shows the aggregate months of theatrical releases for all the 105 Best Picture nominees. Of all months, December was the most popular month for Best Picture Nominees, with 39 percent of all nominated films having a December premiere. For instance, in 2002, all Best Picture nominees were released during the month of December: Chicago, The Hours, Gangs of New York, The Lord of the Rings: The Two Towers, and The Pianist. Figure 2. Most Best Picture nominees were theatrically released in December, November, and October. Following December, the next most popular months for Best Picture nominees were November with 21 percent of all Best Picture Nominees from 1999-2014, and October with 15 percent. Together, a dominant 75 percent of all Best Picture nominees were first released within these three months, while 60 percent of Best Picture-nominated films were released in November or December. These statistics support the theory that movies have a better chance of being nominated if they are released towards the end of the year, and especially during the last month, compared to being released earlier in the year. In addition to dominating Best Picture nominations, films initially released during the months of October, November, and December also dominate Best Picture winners. 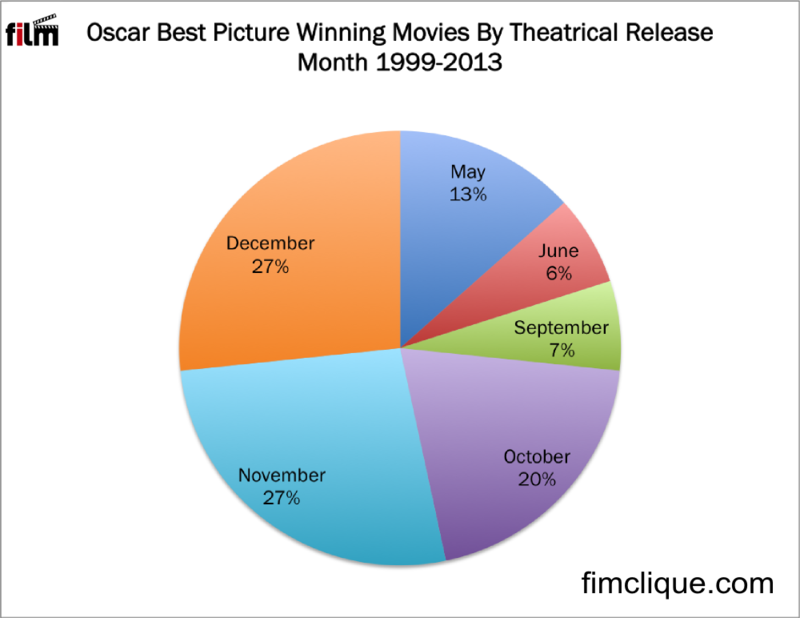 Figure 3 shows the break down of Best Picture-winning films by the month of their premiere in theaters. More than half of films (54 percent) that won the Best Picture Oscar between 1999 and 2013 first debuted in theaters in November or December. Films premiering in December and November had equal shares of winning the top award, at 27 percent each. Close to 75 percent of films that won Best Picture debuted in October, November, or December. Figure 3. Most Best Picture winners were debuted during October, November, or December. Short Memories For Oscar Voters? As trends to release films in latter months for Academy Award contention continues, it will become increasingly difficult for independents to compete with the robust schedule of releases timed for the winter holiday season. Losing that prime real estate, their films would also lose an opportunity for recognition. There’s a chance that release schedules and well-timed promotional campaigns sway voters to give nods to late-coming films, which could explain why films released in October, November, and December do so well with voters. Nevertheless, the typical Oscar voter is an elderly white male over the age of 60. Perhaps to require someone in this demographic to remember films 200 or so days prior is too much to ask. But then we could always diversify the voting bloc if such change would enable a greater diversity of films to be under consideration. Of course the irony is that in trying to find a solution to this back-loading of movies is to make a plea to an Academy that has historically been opposed to fostering diversity or acknowledging the contributions of many anyhow. The contrary argument is that film distributors, instead of releasing their gold mines in January or February, save the best for last—the final months of the year. But still, this argument assumes that film distributors do believe Oscar voters have short memories. Otherwise, why not keep the box office interesting throughout the year instead of packing in the bunch of Oscar contenders into the Thanksgiving and Christmas periods? The distribution patterns of mainstream films is, no doubt, affected by cycles. Hollywood blockbusters blanket our screens from Memorial Day weekend through the Fourth of July right on to the end of the summer, when the weather is warm and the kids on vacation from school. Due to Oscar popularity that buzzes towards the end of the year, distribution cycles for films that would otherwise fill inactive months–March to September–are holding off until the fall and winter, so that Academy members can have them fresh in their minds when Oscar voting season comes around. 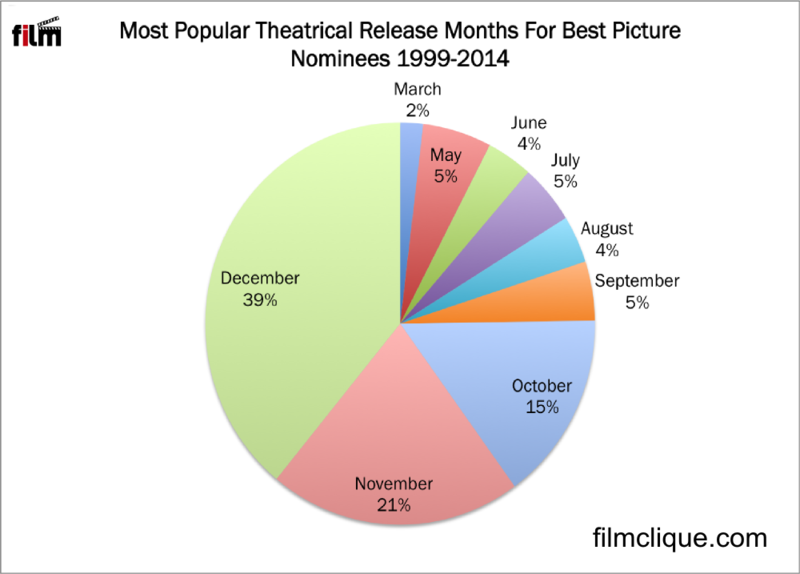 For movies released in 2013, no Best Picture nominee was released earlier than October. Of this year’s 8 Best Picture Nominees—American Sniper, The Imitation Game, Selma, Birdman, Boyhood, The Theory of Everything, The Grand Budapest Hotel, and Whiplash, only 2 films were released before the last 3 months of the year. Boyhood debuted in theaters in August, while The Grand Budapest Hotel had an even earlier theatrical release in March. Outside of these 2 films, every Best Picture Nominee for the 2015 Oscars was released to theaters during the latter months of 2014 in October, November, or December. No signs indicate that this pattern, of Best Picture nominees coming from later months, will slow down in future years. Film producers and distributors with hopes for Oscar nods tend to be released closer to the end of the year, perhaps for highest consideration and also to boost box office receipts that are sure to increase if the movie receives a boost with multiple nominations. This strategy might work well for filmmakers and distributors, but for viewers, however, there will be questions concerning whether the theaters hold any entertainment to entice them while they wait for the season of plenty. Does this mean that if audiences desire movies with critical acclaim, they should only patronize theaters between September and December? Viewers have criticized the movie industry for developing considerably long stretches in the beginning of a new year, after the Oscar season has passed and those movies have milked their last drops from the box office, during which no notable movies are released. This report gives new weight and credence to those grievances. This is ridiculousness. That is all I can say. The Oscars need to fire all the white male voters. Those idiots are racists. Still even if you want your film to be nominated you still need to be white and male. It’s the story of white America and America – whites riding Black men’s d-cks to fame ans superiroty. They just never leave Black people alone. It’s like they are addicted to it or something! They rode Malcolm X, then Martin Luther King Jr., then Obama, then Cosby – just riders, these whites here in America. So let them have the Oscars! All of it. The Oscar voters have amnesia. If the event occurred too distant in the past, well forget it. I think what they have is more akin to Alzheimer’s. They are old white men and they can’t remember 3 months in the past. So if your white male friend wants some advice on whether his new movie it gonna make it or not, there you go. Tell them about these old senile white men voters of the Oscars who suffer from Alzheimer’s.